It was August of the year 1856. Summer was turning to autumn in Elberfeld, a small town in western Germany. Johann Carl Fuhlrott, a teacher at the local high school and an amateur naturalist and fossil collector, was heading purposefully in the southwest direction. A few days earlier Fuhlrott had received a message from a mining foreman working in a valley less than 15 kilometers from Elberfeld: two Italians workers in his limestone-quarry had broken through the rock-hard layers of clay at the entrance of a cave situated on a steep ridge and accidentally unearthed some fossilized bones. It had seemed to the foreman that they were the remains of an ancient cave bear and he wanted Fuhlrott to come and take a look . His curiosity piqued, Fuhlrott had immediately determined to visit the cave. The valley Fuhlrott was heading to, was quite well known in the region. It had been formed by a stream, Düssel – which originated near the ancient town of Wülfrath, located on the spur of a mountain north-west of Elberfeld – and then meandered westwards to meet the Rhine near the city Düsseldorf. A few kilometers before its confluence with Rhine, the stream had originally flowed over a section of limestone rocks. Over thousands of years, it carved out a narrow canyon which gradually turned into a beautiful valley – with limestone cliffs towering more than 150 feet high, waterfalls, many small and large limestone caves and lush Beech trees . In the late 17th century, the valley had become a favorite haunt of a young and locally popular pastor, who would often hike through it to find inspiration in the pleasant surroundings to compose his hymns. 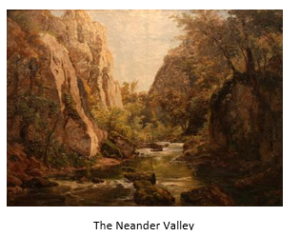 The pastor, Joachim Neander, died young at the age of 30 due to tuberculosis and by the early 19th century the valley had come to be locally called Neandershöhle (Neander’s Hollow). Its picturesque qualities had also made it a favorite training ground for the students of Düsseldorf Arts Academy. Some years back, however, to the consternation of many locals, the valley had also started drawing the attention of professional miners, who were now quarrying the limestone at an industrial scale. As Fuhlrott approached the ravine, the workers pointed him towards the cave on the precipitous southern side, about sixty feet above the stream and a hundred feet below the top of a cliff. Fuhlrott, who had just turned 53 that year, made his way up to the mouth of the cave. After pausing to catch his breath, he stepped inside gingerly – the roof was about 6 feet high and the cave 8 feet wide and 15 feet deep. He was standing on loam, almost 5 feet thick, which covered the floor of the cave . The fossilized bones, he was informed by the miners, had been found in the loamy floor at a depth of about 2 feet. Though initially ignored, they had later fortuitously come to the attention of the quarry owners who managed to salvage 16 bones and bone fragments from the rubble. Knowing Fuhlrott’s keen interest in the subject, they now offered these to him. Back home in Elberfeld, Fuhlrott took stock of the fossilized collection of bones – it contained a skullcap with a fragment of the left temporal bone (situated at the sides and base of the skull), a part of the right shoulder bone, a right collarbone, both long bones of the forearm, a complete forearm bone and some other fragments of the forearm, five ribs, left half of the pelvis and both thigh bones . Bent over his desk studying the fossilized remains, the intuition that Fuhlrott originally felt in the cave grew even stronger – the bones were clearly not that of an ancient bear as the miners had assumed; but more importantly – they seemed like the remains of a human being who was significantly different from modern humans! Within a month of Fuhlrott’s visit to the cave, a local newspaper published the story of the curious find. This drew the attention of Hermann Schaaffhausen, a portly Professor of Anatomy at the University of Bonn, who was researching on prehistoric humans of Europe. Three years earlier (i.e. six years before Darwin published On the Origin of Species) Schaaffhausen had presented the idea of species evolution in an article titled On the Constancy and Transformation of Species. Fuhlrott and Schaaffhausen met in Bonn the following November and Fuhlrott passed on the bones to Schaaffhausen – who was immediately taken by the unusual shape of the skull. After about six months of detailed study, they jointly presented the results of their investigations at an academic gathering – with Fuhlrott highlighting the age of the bones as proved by the depth of the stratum in which they were discovered and the mineralization and dendrite formation on the surface and Schaaffhausen describing the unusual shape of the skull cap (low, sloping forehead and the bony ridges above the eyes) as well as the remarkably thickness of all the bones in general. Both suggested that the bones belonged to a human of pre-historic times, who had inhabited Germany before the arrival of the ancestors of modern humans. From the time of Aristotle until the 18th century, it was commonly believed that species do not change or go extinct and have no genetic relation with each other even if some of them appeared to be similar. It was only in the early 19th century that the idea that species could change over time, started to take root among European naturalists and scientists, such as Lamarck. In 1859, Darwin famously suggested that populations evolved (into different species) through natural selection of naturally-occurring variations among its individuals. Broadly, all organisms that tend to mate naturally and produce fertile offspring easily are said to be from the same species. At times, however, different groups (or populations) of the same species may become isolated from each other. Over thousands of years, these different populations tend to accumulate certain genetic changes (or mutations) which are beneficial to the members of a particular population (for e.g. by making them better adapted to their peculiar surroundings) but are not present in the other populations of that species. After a point, such genetic and behavioral changes make inter-breeding between the individuals of these populations rare and subsequently, impossible. The population(s) is/are then said to have speciated i.e. they have become distinct species. Two or more species that have evolved in this manner from a common ancestor are grouped under one genus and similar genera are grouped under one family. As an instance: lion, tiger, jaguar, leopard and snow leopard are all considered distinct species as they tend not to mate with each other and in the rare cases that they do, their offspring tend not to be fertile. All individuals of these 5 species however are related to a common ancestor – which is believed to have lived about 6 to 10 million years ago – and hence, these species are grouped together under one genus Panthera. The scientific name of each species, too, consists of two parts – the first part, which is common to all five, is the name of the genus; whereas the second part, is specific to each species. Lion is thus scientifically called Panthera leo, tiger: Panthera tigris, jaguar: Panthera onca, leopard: Panthera pardus and snow leopard: Panthera unciaThese 5 species of the genus Panthera, along with some other species such as cougar, cheetah and domestic cat (which belong to various other genera), together, form the Family Felidae – more commonly known as the ‘family of cats’. Six years after Fuhlrott and Schaaffhausen had presented the findings of their investigations on the fossilized bones of Neander-tal (tal is German for valley), William King, an Irish geologist, began a process that continues to change our understanding of ourselves and our place in this world: he proposed that the Neanderthal bones were neither of Homo sapiens nor of any other genus of the Hominidae (great apes) family but that of another human species – which he called Homo neanderthalensis . Over the last one and a half centuries since then, with the help of hundreds of newly found fossil records and archeological sites in different parts of the world as well as advancements in fields such as molecular biology and genetics, we have managed to piece together a relatively clearer picture of our evolution as a species, though much continues to remain ambiguous or unknown. Our genus, Homo, these detailed investigations tell us, evolved from one of the extinct genera of the great apes family: Australopithecus, which evolved in eastern Africa about 4 million years ago and gradually spread throughout the African continent. Though their brain size (about 450 cm3) and jaw-shape were closer to the apes, Australopithecus were obligate (i.e. habitual) bipeds unlike apes – as first indicated by a 24 meter line of 3.7 million old fossil foot-prints of 3 individuals of the genus, preserved in volcanic ash (and discovered in 1976) in what is now Tanzania . An isolated population of one of the Australopithecus species is believed to have given rise to our genus Homo between 2 and 3 million years ago, before Australopithecus eventually went extinct circa 2 million years ago. The oldest known species of the Homo genus who evolved from Australopithecus – i.e. the first humans – were Homo habilis. They were shorter in stature (about 4 feet 3 inches tall) with disproportionally long arms when compared to us, but a much enhanced cranial capacity as compared to Australopithecus, at 600-650 cm3. They were also the first to use advanced stone-tools and flakes regularly, often to butcher and skin dead animals. The next two closely related Homo species were Homo ergaster and Homo erectus. Homo ergaster is believed to have evolved (either from or independent of Homo habilis) about 2 million years ago and lived in eastern and southern Africa till about 1.4 million years ago. Their cranial capacity was higher than Homo habilis, at about 900 cm3 and they used much more advanced and diverse tools, such as bifacial axes. Though it has not been proven conclusively yet, many scientists believe that Homo ergaster was the first human species to migrate out of Africa into Europe and Asia and this branch later evolved into another species: Homo erectus. Others hold that Homo erectus in fact evolved in Africa and then spread to Asia and Europe. Homo ergaster specimens, in their view, are not of a separate species but a population of Homo erectus that stayed back in Africa. What is commonly agreed in the scientific community, however, is that Homo erectus spread to regions as far as Georgia, India, Sri Lanka, China, Vietnam and Indonesia between 1.8 million and 1.3 million years ago. It was also one of the most enduring human species, which survived till 70,000 years ago in some parts of the world. Homo erectus stood 5 feet 10 inches tall on average and the cranial capacity of the later Javan/Indonesian specimens is as high as 1100-1200 cm3 – which is similar to humans. They are also believed to be the first humans to cook their food and make controlled use of fire. Meanwhile, a population of Homo ergaster (or Homo erectus that had stayed back in Africa – depending on which version is finally proven to be right) evolved into another species: Homo heidelbergensis, which anatomically, shared features with both Homo erectus and modern humans. They seem to have appeared around 700,000 years ago in Africa. Between 300,000 and 400,000 years ago some groups of Homo heidelbergensis migrated into Europe and West Asia and some others into Asia. Archaeological sites linked to the Europe/West Asia group have been found in Spain, Italy, France, England, Germany, Hungary and Greece. It was this group that eventually evolved into the species whose specimen was found by the limestone miners in the picturesque Neander valley of western Germany in the August of 1856: Homo neanderthalensis. The Asian group on the other hand developed into Denisovans (which we will know more about in the next section) and a group of Homo heidelbergensis that stayed back in Africa (earlier also categorized as Homo rhodesiensis) evolved into our own species: Homo sapiens or ‘modern humans’. (Homo heidelbergensis, Homo neanderthalensis and Homo rhodesiensis, are sometimes grouped together as archaic/ancient humans). In everyday language, being called a Neanderthal is taken as an insult – the image of Neanderthals as uncivilized, stupid and uncouth ‘cavemen’ developed as a result of wrong interpretation of scanty evidences in the 19th century as well as the religious/political biases of the experts of the time. Neanderthals evolved approximately (300,000-400,000 years ago) around the same time as modern humans (approximately 200,000 years ago) and shared a common ancestry till Homo heidelbergensis. Physically they were more than a match for us modern humans – comparable in height (about 5 feet 6 inches on average), they had proportionally shorter but stronger limbs, reduced chin, large nose and a larger, barrel-shaped rib-cage. Overall, they are believed to have been stocky and incredibly strong. They also had larger cranial capacity (1600 cm3) as compared to us (1300 cm3) and better eyesight. Neanderthals made highly advanced tools out of bones, antlers, wood and stones; such as hammers, task-specific axes and spears. They kindled fire at will, could use artificial lighting when inhabiting caves, built dwellings and hearths, were apex hunters (laying sophisticated traps and hunting in groups to bring down even large animals such as mammoth) and generally lived in groups of 10-15 (in which, based on some early mtDNA evidences, males remained in the same social group and females joined the groups of their ‘partners’) but were nevertheless capable of forming larger and more complex social groups, at times. We have also discovered skeletal evidences which show Neanderthals buried their dead at times, took care of their injured – nursing them back to health, were capable of uttering words and may have had a language. Other than meat, their diet consisted of cooked and uncooked plant matters, nuts, mushrooms, seals and shellfish and though we do not know if they traded, we do have evidence that they were navigating the Mediterranean Sea in dug-outs as early as 110,000 years ago. Some archeological sites indicate that they extracted glue from birch bark by heating it at extremely high temperatures, used jewelry and dye and collected bird-feathers – possibly for personal ornamentation. One of the sites has also yielded a hollow bear femur with what appears to be intentionally spaced and neatly cut holes. It has been suggested that it may be part of a flute or some other musical instrument. Homo neanderthalensis and Homo sapiens – lived in the same regions (roughly from present-day England to Uzbekistan) for many thousand years; at times even dwelling at the same sites or in the same caves in which a group of other species had lived a few decades or centuries earlier. The last group of Neanderthals seem to have survived (in Southern Spain) till about 25,000 years ago. For a comparative perspective, consider that the Halfan culture of Egypt started to appear around the same time and the first agricultural settlements of modern humans date from about 12,000 to 10,000 years ago. What is even more surprising to ‘modern humans’ is the findings presented by Max Planck Institute for Evolutionary Anthropology in Leipzig, Germany, after studying DNA recovered from bone fragments of a Neanderthal female, which finally answered the question that was on the mind of many researchers: did our species inter-breed with Neanderthals? The answer, was a stunning yes. Between 1 to 4 percent of the genes of modern humans outside Africa comes from Homo neanderthalensis. This includes genes that regulate our immune system, our skin and hair growth and pigmentation, our metabolism and our tolerance for cold weather. What is more, in 2010, scientists found the remains of another species of humans – which is temporarily being called Homo sapiens Denisova – in a remote cave in Siberia, which had also been inhabited by Neanderthals and modern humans at different times. Denisovans shared their origin with Neanderthals and were spread from Siberia to South East Asia. The genetic studies proved that modern humans interbred with this species as well and between 3% and 5% of the DNA of modern-day Melanesians and Aboriginal Australians come from Denisovans. In fact, the specific gene-variant that allows native Tibetans to survive better than others in the low-oxygen & high altitude conditions of their homeland, is likely to have been acquired from the Denisovan ancestors. The last Homo species, other than ours, to have survived to modern times may have been Homo floresiensis, which is believed to have evolved from migrating populations of Homo erectus, and lived on the geographically isolated island of Flores in Indonesia. Some studies have suggested that they may have survived on the island till about 12,000 years ago – long after the island was also inhabited by our own species. The story of evolution of our genus and species attempts to (at least partly) answer some of our eternal questions – who are we, where do we come from and where are we headed. But it is also fascinating because it presents a good example of how scientists work: hypothesizing, assiduously piecing together evidence over generations, building on findings and contributions of others, discarding hypotheses that are no longer tenable in the face of new evidence and, of course, the occasional strokes of serendipity! This story draws from fields as diverse as anthropology, geology, biology, anatomy, physics, chemistry, and molecular biology – and can thus also be used as an example of how different scientific fields are brought together to answer questions that were once considered ‘unanswerable’ or outside the ‘scientific magisterium’. • Teaching Evolution through Human Examples (http://humanorigins.si.edu/education/teaching-evolution-through-human-examples): Using examples such as evolution of human skin colour and humankind’s adaptation to altitude, these four curriculum units help explain the difference between acclimation and adaptation, the scientific support for natural selection and how evolution is a continuous process. • Comparison of Human and Chimpanzee Chromosomes (http://www.indiana.edu/~ensiweb/lessons/chromcom.html): What can a study of our chromosome, especially when compared with chromosomes of other species, tell us about our evolutionary history? This lesson plan helps students compare the banding patterns seen on stained chromosomes from humans and chimpanzees and explore their evolutionary relationships. • Mystery Skull Interactive (http://humanorigins.si.edu/evidence/human-fossils/mystery-skull-interactive): How do scientists know whether a newly discovered fossil is that of an already identified species or a new species? This interactive website allows students to identify a ‘mystery skull’, using methods similar to that scientists use in their work. • Becoming Human (Documentary): Based on recent scientific findings, this documentary explains the significance of Australopithecus in human evolution, describes a nearly-complete specimen of Homo erectus found in Kenya and explores the fate of Neanderthals. The website http://www.pbs.org/wgbh/nova/evolution/ has many more audio-visual resources for teaching evolution. The fact that perhaps there were a dozen or more species of humans could also lead to rich and lively discussions in classrooms. After all, some of these species were barely distinguishable from us; others ultimately survived for as many as 2 million years (as compared to 0.2 million years that we have been around) in harsh and ever-changing climatic and geographical conditions. Some even existed at the same time and in the same geographical regions as our own species! Explore some of these questions with your students – are Homo sapiens as different from other ‘animal’ species as we often assume? Are we really, as many religions and cultures would like us to believe, at the ‘pinnacle’ of evolution? Assuming one other human species had managed to survive till the present time, how do we think we’d have treated them? Would these humans – who bequeathed part of their genomes to us – be part of our societies, or our zoological gardens? Would ‘human rights’ be extended to them? And, also, why did none of the other human species survive till modern times when they had managed to survive for hundreds of thousands of years before our species appeared? What role, if any, did our ancestors have in their mass disappearance? And what does their disappearance and our evolutionary history mean for our future? Aczel A (2008) The Jesuit and the skull. Penguin Group USA. Leiderstam M (2011) Neanderthal Landscape – after the dissertation. Journal of Artistic Research. Lyell C (1863) Geological evidences of the antiquity of Man. Schrenk F, Müller S (2005), Die Neandertaler. C. H. Beck, Münich. King W (1864). The reputed fossil man of the Neanderthal. Retrieved from: http://www.boneandstone.com/articles_classics/king_1864.pdf. Toth N and Schick K (2005). African origins in the human past: World prehistory and the development of human societies (Editor: Chris Scarre). London: Thames and Hudson. Masao, FT; et al. (2016). New footprints from Laetoli (Tanzania) provide evidence for marked body size variation in early hominins. Mooallem J (2017). 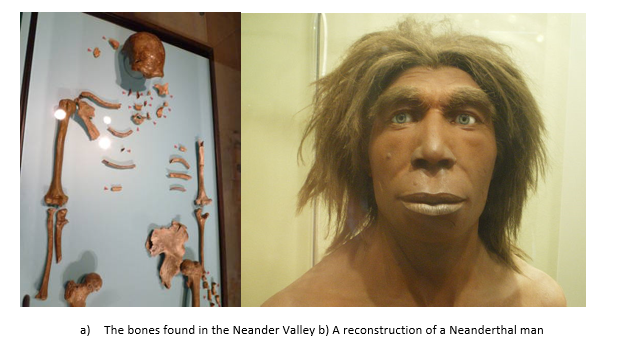 Neanderthals were people too New York Times Retrieved on 13th March 2017 from https://www.nytimes.com/2017/01/11/magazine/neanderthals-were-people-too.html? . Singer E (2016). How Neanderthal DNA helps humanity Quanta Magazine Retrieved on 13th March 2017 from https://www.quantamagazine.org/20160526-neanderthal-denisovan-dna-modern-humans/.